Being involved in any sort of vehicle accident can be scary, but being in a commercial truck accident can result in more damage and injuries than other vehicles. In fact, in 2013 alone, the U.S. Department of Transportation reported 3,906 trucks being involved in fatal accidents. If you or someone you know is involved in a commercial truck accident, it’s important to know what to do next. So, with that in mind, let’s take a look at a few important things you should know about commercial truck accidents. Commercial truck drivers are generally held to higher standards when it comes to driving safely on the roads. They have federal regulations they have to adhere to, which come into play when it comes to factors like how many hours they can drive and how much weight they can haul. Additionally, commercial truck drivers have to keep detailed records of their driving history, which can be beneficial when it comes to personal injury lawsuits after a crash. Truck drivers have more rules and regulations they have to follow due to the ability to cause more harm, and all of this comes into play when compensation for injuries or damages is sought. One of the biggest challenges of handling a commercial truck accident lawsuit is proving fault. This is one of the many reasons why it’s so important to work with a commercial truck accident attorney. Unlike a car accident, there may be multiple parties responsible for commercial truck accidents. The driver could certainly be at fault, but the inspection company, leasing company, or the owner of the product being hauled could all play a role in being at fault as well. Overall, commercial truck accidents are more complex to litigate simply because there are more people, companies, and parties involved. Fortunately, a commercial truck accident attorney will have the experience needed to determine fault. 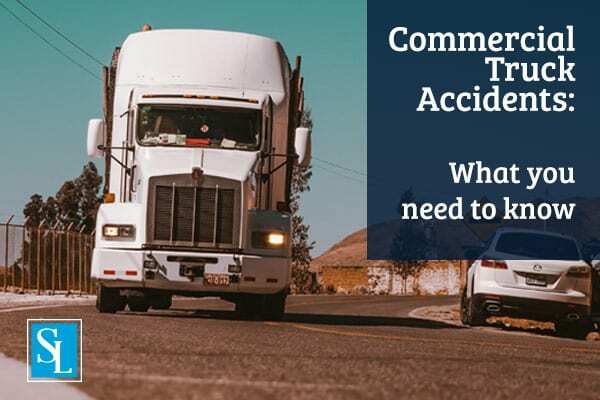 Just like car accidents, people involved in commercial truck accidents may have more than one type of damage for which they can seek compensation. When it comes to commercial truck accidents, people may have such damages as pain and suffering, medical expenses, lost wages, and more. But because of the severity that may come with a commercial truck accident, damages may be more than normal car accidents. But all in all, it’s important to work with an experienced attorney to ensure you have the best chance of receiving the compensation you deserve. Commercial truck accidents can be complex and frustrating, especially when serious damage or injuries are involved. So keep these factors in mind, and work with a reputable law firm to ensure you have the strongest case possible. If you are involved in a commercial truck accident, contact the Steigmann Law Team today for a free consultation.